WASHINGTON — Records show the head of the Environmental Protection Agency spent weekends in his home state during his first three months in office, frequently flying to and from Oklahoma at taxpayer's expense. EPA Administrator Scott Pruitt's expense reports from March, April and May were released following a Freedom of Information request filed by Environmental Integrity Project, a nonprofit watchdog group. Pruitt, a Republican, served as Oklahoma's attorney general prior to his appointment by President Donald Trump to lead EPA. Married with two children, Pruitt owns a home in Tulsa, Oklahoma. There were a couple of occasions where Pruitt traveled on a trip for EPA and then paid out-of-pocket to fly to Tulsa before returning to Washington at government expense. EPA records indicate Pruitt also attended "informational meetings" during the trips, which were first reported by The New York Times. Though a trip to Oklahoma might last three or five days, it was not unusual for only one such meeting to be listed during Pruitt's time away from Washington. An example is Pruitt's reported trip to Tulsa on Friday, May 19, on a flight scheduled to depart Washington at 5:37 p.m. The listed purpose of the trip was an "informational meeting" at the Brainerd Chemical Company in Tulsa. Pruitt's return flight to Washington was scheduled to depart the following Monday morning at 6 a.m. local time. Records show EPA paid $1,980 for Pruitt's roundtrip ticket on a commercial airline, well in excess of what an economy class ticket typically costs on that route. Federal regulations allow government travelers to fly business class or first class only when no cheaper options are "reasonably available." Pruitt was also reimbursed $127 for meals and expenses, according to the records. Among the questions to which Bowman did not respond was whether EPA staff or members of Pruitt's full-time security detail traveled with him. She also did not answer questions about the official purpose of specific trips or whether Pruitt flew first class. A call to the family-owned distribution company's chairman, Mat Brainerd, was not immediately returned. He testified before congressional panels in favor of extending the Keystone XL oil pipeline and against part of the Clean Air Act. In a statement to the Times, Bowman said: "The administrator's travel, whether to Utah, Michigan or Oklahoma, all serves the purpose of hearing from hard-working Americans about how EPA can better serve the American people." The Heritage Foundation, a free-market think tank that receives funding from groups tied to the fossil-fuel industry, paid for Pruitt's hotel room in Colorado Springs, according to his travel form. Though Pruitt's expense report indicates an "ethics form is prepared" to allow the outside group to pick up his hotel tab, a copy of that form was not provided by the EPA. Eric Schaeffer, executive director of the Environmental Integrity Project, said the records obtained by his group reflect Pruitt's priorities. 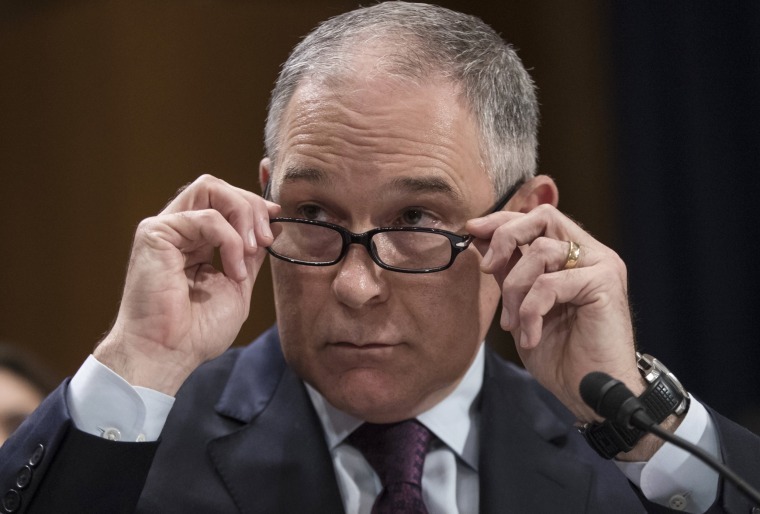 "These travel records show that Administrator Pruitt is more focused on cultivating his relationships with industry and conservative political organizations in his home state of Oklahoma than he is on protecting the environment and the public health for the rest of America," said Schaeffer, who served as the head of EPA's office of civil enforcement from 1997 to 2002.